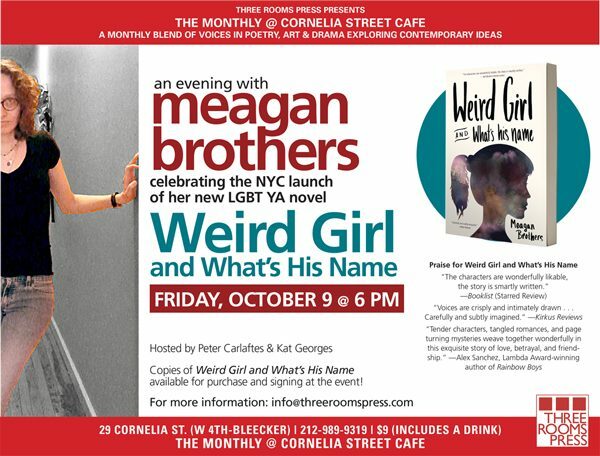 Award-winning LGBT YA author MEAGAN BROTHERS celebrates the release of her extraordinary new novel WEIRD GIRL AND WHAT’S HIS NAME with a reading at Cornelia Street Cafe on Friday, October 9 at 6 pm. “An Evening with Meagan Brothers” will feature the author—whose previous books include Debbie Harry Sings in French and Supergirl Mixtapes—reading from her new book and sharing stories about what inspired it. A book signing follows the reading. Copies of WEIRD GIRL AND WHAT’S HIS NAME will be available for purchase and signing at the event.